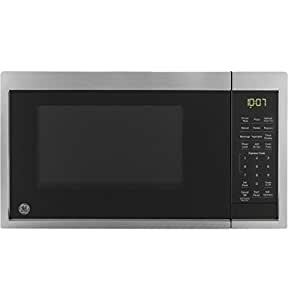 This GE .9 cubic feet 900 watt Stainless Steel microwave uses latest smart home skill for voice for hands-free convenience. Speak directly to Alexa to achieve the ultimate in kitchen convenience. Hands cooked in cake batter just say, âAlexa, microwave for 45 secondsâ. forget your coffee in the microwave and youâre upstairs just say, âAlexa, reheat coffee.â with scan-to-cook technology, this smart microwave takes the guesswork out of Frozen food microwave instructions. Cook with the right settings with the GE appliances kitchen app. Just Scan the bar Co de and the microwave is correctly programed to the right power level and cooking time, making your food turn out just as the manufacturer intended. No need to change power levels or read instructions. For a list of compatible products, visit GE appliances/connect. This is the ideal size for any home or apartment kitchens, college dorm rooms or office break rooms. Sensor reheating lets you optimally cook and reheat the seven most popular food items (beverage, dinner plate, Pizza, popcorn, potato, reheat and Vegetable) with the touch of a button. Choose from ten power levels up to 900 watts. The electronic digital display has a clock function and can also display a countdown timer as well as the cooking time remaining. And, the classic Stainless Steel exterior will look good in any kitchen. Nice idea that’s been poorly implemented. I’m using the GE Appliances app on an iPhone. Once I connect the microwave to my WiFi, I can find the microwave with the GE app, but it keeps going online, then offline, then online, etc. Also, the app crashes on a fairly regular basis. When it’s online, the screen has a “bar code” icon which you can use to tell it to scan a UPC code on a frozen dinner. The scanning process is finicky and it takes a while to successfully scan a code. Only 2 of the 6 products I tried to scan are even supported. Once a supported product is scanned, the iPhone screen displays the cooking instructions with a “Send” button. When I hit the send button, all it does is send the initial time and power setting to the microwave – I still have to press start on the microwave. When it came time to “remove product, stir, and replace product back in microwave”, the app seemed to lose track of where it was and I had to finish the job manually. If the microwave oven loses power, the display shows PF. It seems you have to press the Cancel button to clear that state before the app will work again. Plus, you need to re-enter the microwave’s Model Number into the app each time the power fails?!? Actually, it’s more often than that. I just tried the +30 second button and it asked for the Mode Number again. I don’t think they did a lot of testing back at the lab? P.S. The clock sync feature doesn’t work. I called the provided for technical support – they only handle getting the initial WiFi working. That person forwarded me to the parts department which wasn’t helpful. I called back the original number and was told to contact GE Answers with actual non-connectivity issues. The service rep I spoke with at GE Answers didn’t have any answers regarding all the issues I mentioned – his response was “they just came out with these” (as if to say “the bugs aren’t worked out yet”). His only answer was that I should call Consumer Relations to get a replacement. I don’t think I’m gonna waste more time on this right now. Got the microwave, tried to get it connected and it wouldn’t work. The method for connecting this damned thing to wifi is one of the strangest I’ve seen yet, and it certainly didn’t work. They ask you to input a password printed on the door of the microwave to get it online and the app simply wouldn’t recognize the password. As it stands, it’s just an ok microwave with none of the functions promised. EDIT: After much trial and error and a long back-and-forth with GE, they finally got it working. Now my one star review is this: If you advertise that your microwave can simply scan a product barcode and know how to cook it, I’d suggest making sure the MOST common microwavable foods available are in your database. Srsly, Lean Cuisine? You know have Lean Cuisine in your database? Come on, GE! I picked up 2 alexa controlled devices recently,this is the only one to work out of the box. Setting it up was straightforward. The process was symilar to setting up an alexa unit, with an extra password thrown in. The picture the app shows me for where to get the password off the microwave was wrong, but I still managed to find it. The one feature that doesnât seem to work is time sync… Not really a game breaker though. The good: Once it’s setup the voice command is instant. It brings a smile to my face. The bad: Setup works but it’s confusing. I’m still not sure how I did it. Getting your phone settings right and downloading the right app (Kitchen) took a little time. Alexa is picky about how you phrase your words. Wishes: I wish the shopping list feature in my Alexa app would coordinate with the list of available bar code items. Took a few tries to get GE app to connect, after that everything was easy. I’ve had no problems using Alexa or scan-to-cook. Looks nice, works well. App is convenient. Is there a way to tell what items are in their database? I scanned 5 items and only one worked (Lean Cuisine). I’ve resolved the issue – a new Alexa Skill was released named “U+ Connect” & now it works great! I know it’s still early, but I received mine today & it doesn’t connect to / accept commands from Alexa yet. The Skill is enabled, but no-go. However, for me, the main selling point was its ability to connect to / accept commands from Alexa & that doesn’t work, at all. At least for now.